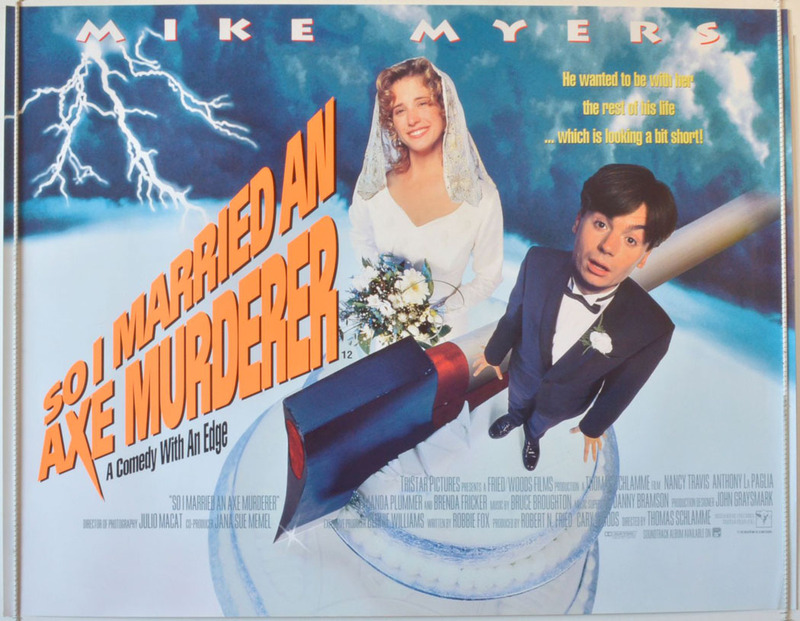 What It’s About: Commitmentphobe Charlie MacKenzie (Mike Myers) meets the girl of his dreams (Nancy Travis) but begins having second thoughts when all signs point to the fact that she is Mrs. X, a serial axe murderer who kills her husbands on their wedding nights. Why Watch it Today? : Today we have a first-two reasons to watch. Alcatraz closed today in 1963 and it is also World Poetry Day. Charlie is a poet; there is also a memorable scene in which Charlie and his cop friend (Anthony LaPaglia) take a tour of Alcatraz conducted by a tour guide named Vicky (Phil Hartman). Other Choices: Alcatraz also features prominently in Point Blank. This entry was posted in Comedy, Cops, Movie of the Day, Mystery, Romance, Serial Killer, Thriller, Whodunnit and tagged Alan Arkin, Alcatraz, Amanda Plummer, Anthony LaPaglia, axe murders, bad poetry, California, cameos, Charles Grodin, coffee shop, Debi Mazar, interrupted wedding, Michael Richards, Mike Hagerty, Mike Myers, Nancy Myers, Phil Hartman, poet, San Francisco, Scots, Steven Wright, tabloids, TriStar Pictures, wedding, wedding night, World Poetry Day.